Caffeine pills are available without a prescription for a number of indications. Most commonly, they are used to promote wakefulness. Your doctor may tell you to take these pills for more specific health or psychological conditions. Talk to your doctor to learn more about how caffeine use can affect your health. Caffeine is a stimulant naturally found in coffee, tea and cocoa and added to many sodas. Caffeine also is available in caffeine pills, typically to help prevent drowsiness. Many headache medications also contain caffeine, as caffeine has been shown to have benefits for tension and migraine headaches. Caffeine pills are sold under popular brand names and a number of generic labels. Your doctor may tell you to take caffeine pills to counteract the drowsiness effects of antihistamines or other medications. Caffeine pills also sometimes are marketed as weight loss pills; however, the use of caffeine as a diet aid is controversial. It is generally recommended that healthy people consume no more that 200 to 300 mg of caffeine per day. This is about 2 to 4 cups of coffee. Caffeine pills for wakefulness typically contain 200 mg of caffeine, according to the Center for Science in the Public Interest. Drugs.com notes that these pills should not be used more than once every 4 hours. MayoClinic.org warns that doses of caffeine above 600 mg per day can causes side effects such as insomnia, nervousness and muscle tremors. Your doctor may recommend that you use more caffeine for certain conditions. In these cases, you may be told to take as much as 1,000 to 1,600 mg of caffeine in a 24-hour period. Talk to your doctor to learn more about the benefits and risks of using caffeine pills for any condition. If your doctor has directed you to take caffeine pills, follow the dosing directions carefully. 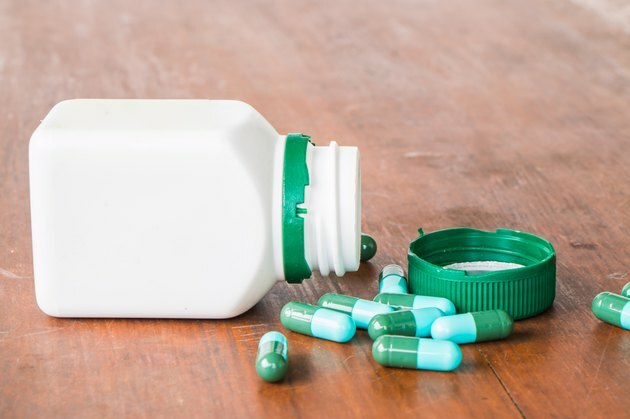 Let your doctor know about any other prescriptions you may be taking, as certain drugs such as antibiotics can interact negatively with caffeine. Also, tell your doctor if you have a history of any cardiovascular or psychological conditions. MayoClinic.com: Does Caffeine Help With Weight Loss?